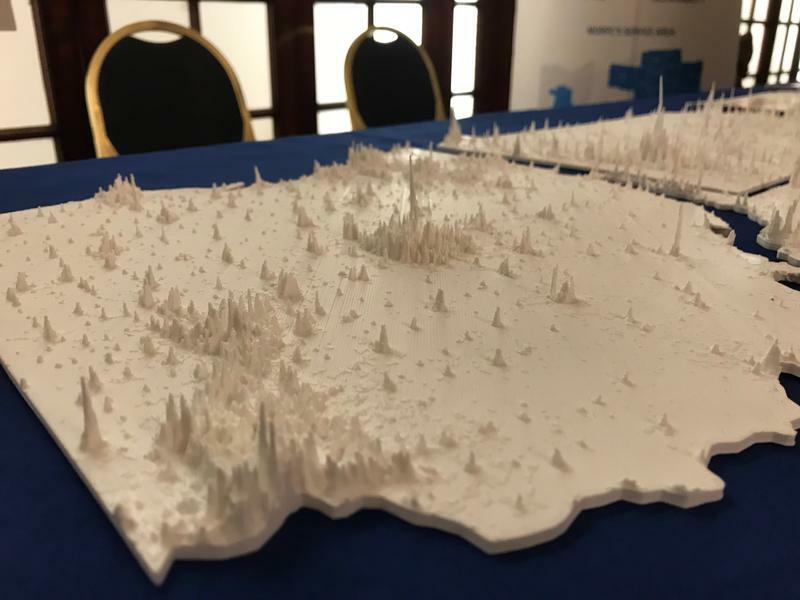 A 3-D printed map shows the density of populations across Ohio, Pennsylvania and West Viriginia. The maps were used in the region's successful bid to be selected as a semi-finalist in the Hyperloop One challenge. Excitement permeated a big ballroom in Alumni Hall on the University of Pittsburgh’s campus Thursday afternoon, where companies and public agencies gathered to share new ideas and innovations for transit. The mobility showcase was organized by the City of Pittsburgh’s Department of Mobility and Infrastructure. 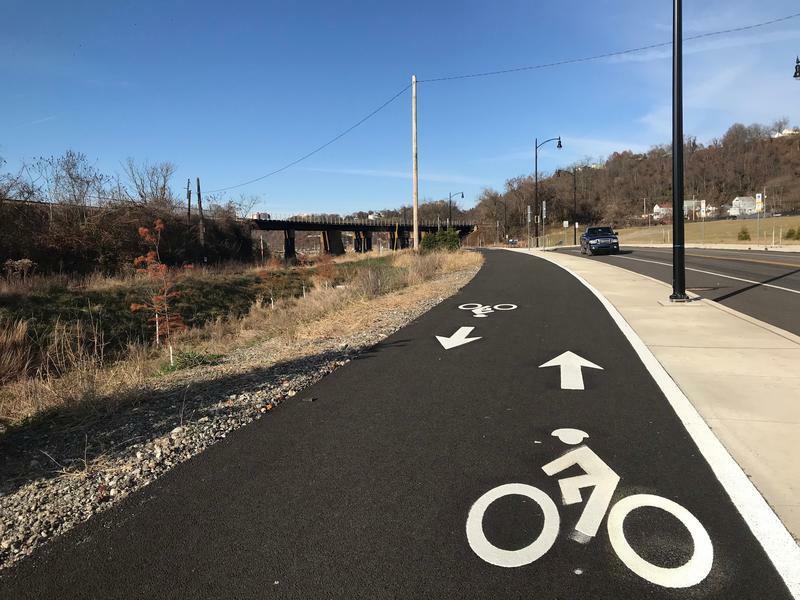 The department hopes to prepare people for big changes in how they move around the region, said assistant director Alex Pazuchanics. Much of that technology involves autonomy. Vehicle manufacturer Local Motors 3-D prints self-driving shuttles called Olli, aimed at solving transit’s “first mile, last mile” problem, said David Woessner, general manager of the company’s National Harbor, Md. facility. Another Maryland-based company, Robotic Research, is expanding its work on autonomous systems for the military into commercial applications. At North Carolina’s Fort Bragg, the company deployed a self-driving shuttle to transport wounded soldiers from their barracks to medical appointments. 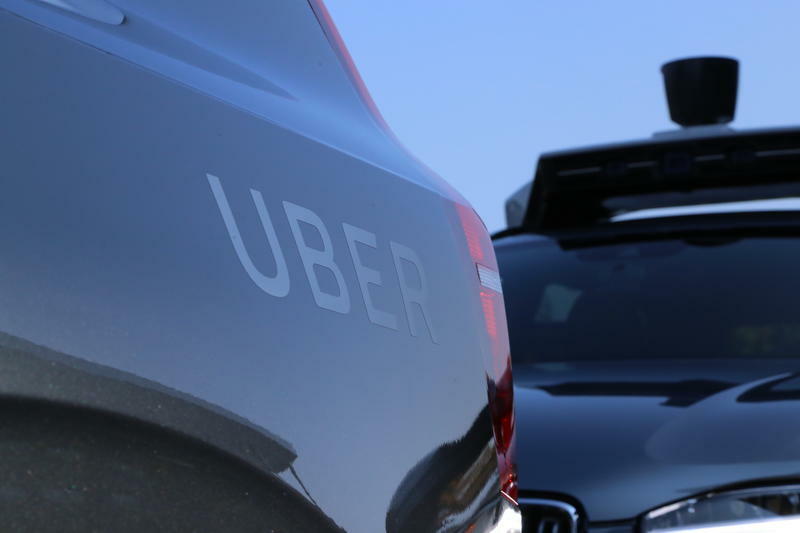 Engineer Daven Bhatt said the platform, called Robotic Research Driven, could address some of the problems associated with paratransit, such as long wait times or inconsistent service. Tables around the room displayed everything from new navigation apps to futuristic transportation possibilities such as hyperloop: a system of passenger or freight trains that would travel through low-pressure tubes to allow for speeds up to 670 m.p.h. In September, the Pittsburgh-Columbus-Chicago route was selected as one of 10 semi-finalists in the Hyperloop One challenge. To accommodate innovations in transit will require the city to leave room for change, said Pazuchanics. For instance, a street-lighting project is being rolled out in Pittsburgh that Pazuchanics said could act as a backbone for smart and electric vehicles. He and others in both government and industry talked about the importance of creating clear operating agreements between cities and the companies that use their streets to test and implement their technology. Pittsburgh has a relatively concentrated downtown -- the distance between Firstside Park on the southern border and the David Lawrence Convention Center that hugs the Allegheny River is less than 1 mile. City Leaders Like To Tout 'Complete Streets,' But What Does That Mean? There’s a lot of public space in Pittsburgh: parks, plazas, medians. But the public spaces people use the most are streets, which make up nearly half of Pittsburgh’s public space.